And that doesn’t take into consideration the countless time he was pnw3d by me- many times with him not landing a blow. 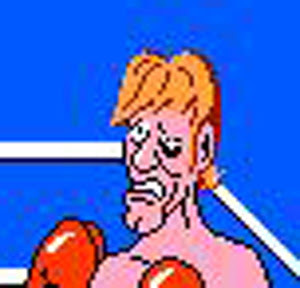 This guy was and is the worst boxer of all time. Looking back, I guess I shouldn’t be surprised- he was 58 years old and from France. The question is, how’d the hell did he win one fight? Who’d he beat? 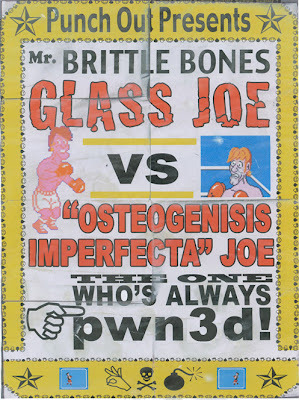 “Osteogenesis Imperfecta Joe”? (Think Sam Jackson in “Unbreakable”). Look, I don’t want my video game to be ultra challenging all the time, but they should be able to beat Abigail Breslin in a fight. 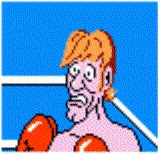 Oh and by the way, an underrated thing in Punch Out, on your way to the title, you have to beat a series of racial stereotypes. Piston Honda? Come on. Soda Popinski? That’s not supposed to be a bottle of Vodka in his hand? Who are you fooling?